I reckon for more than half the time I’ve worked in Toronto, I’ve been within a block of Ema Tei. Yesterday was the first time I went there. I wonder what took me so long? Kenn, my former colleague from EPCOR, took me to lunch there. I was impressed; tasty food, great prices, huge portions and a great atmosphere. There was a good amount of wasabi sneakily hidden under the fish in the sushi, so we both ended up suitably decongested. Part of the charm from yesterday, was the shared company with a good friend! 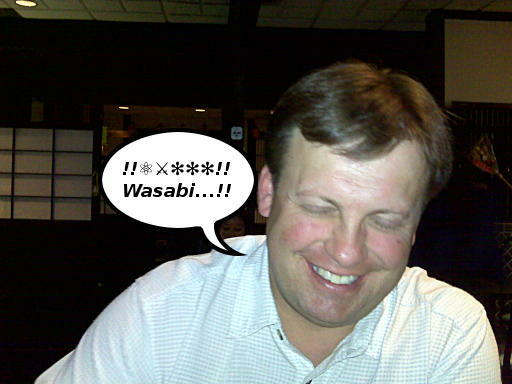 That, and the fact that the Wasabi was cooler than the hottest tea ever produced. Best wishes in your new adventures at Aim. Kenn, next time you’re in the city, leave enough time to get to Burrito Boyz for a jalepeno laden lunch. And I want to be there to see it! Previous Previous post: who are you calling a tube?